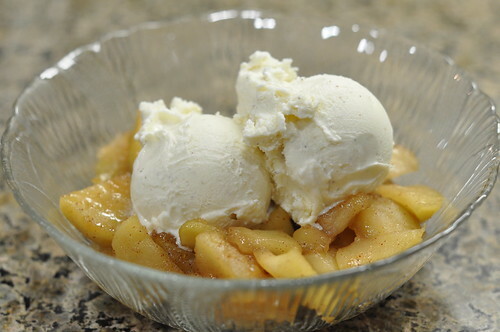 Deconstructed Apple Pie A La Mode. With Homemade Caramel Sauce. How do you maintain your girlish figure? 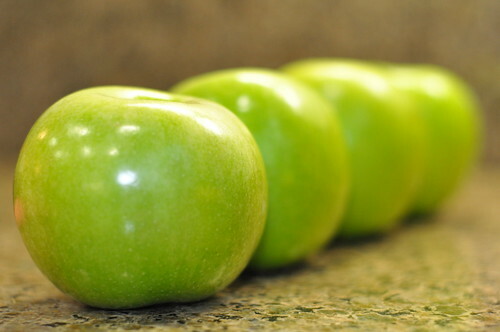 Do you adhere to a healthy diet on most days and allow yourself the occasional cheat day? Or, like me, do you work out just so you can eat everything you want and deny your palate (and linebacker-like appetite) nothing? Half a stick of butter on your baked potato… three scoops of Rocky Road… popcorn and candy at the movies? Hey, with those sprints you did, you earned it. When I went in September, I had mysteriously added a whopping NINE pounds to my already impressive corpulence. I was only supposed to gain, like, four pounds. Oopsie. No. It didn’t stop me. I took my extra nine pounds walking every day. And together, The Nine and I attended Bar Method classes almost daily. Nothing comes between me and my treats. I was like a mother who gets three jobs to support her children. Treats and I were staying together at all costs, even if it meant two workouts a day. And you know what? It worked. At this month’s doctor appointment (a.k.a. THE WEIGH-IN), I had acquired a mere 2 pounds since last time. VICTORY IS MINE. 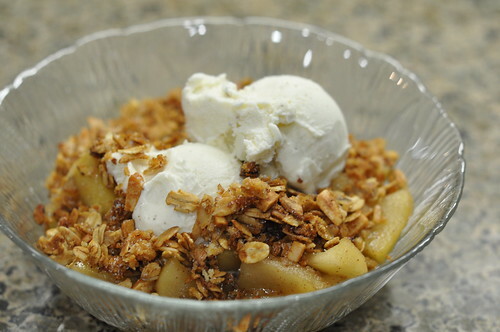 And so is this deconstructed version of apple pie a la mode. 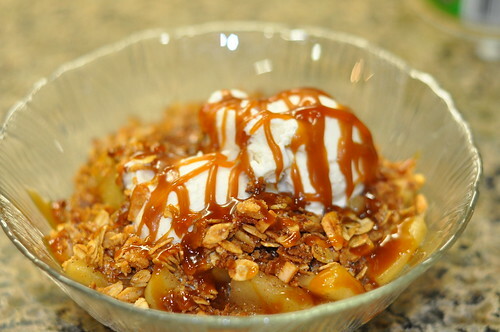 With homemade caramel sauce. Booya! 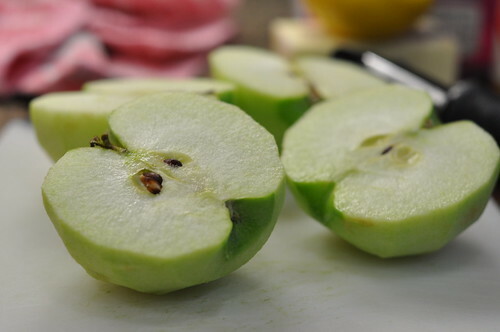 Peel, core, and slice apples into bite-size pieces. 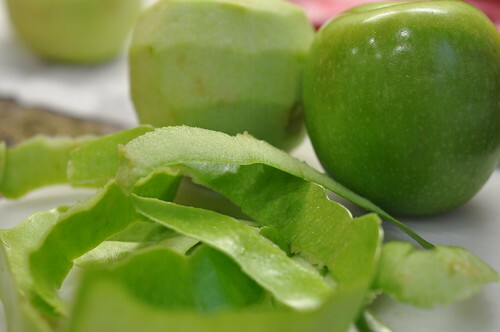 Toss with lemon juice to prevent browning. 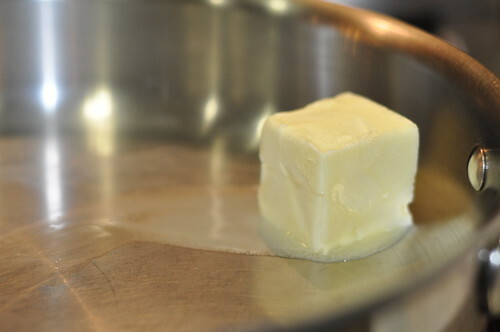 Melt butter in a pan over medium heat until hot and foamy. 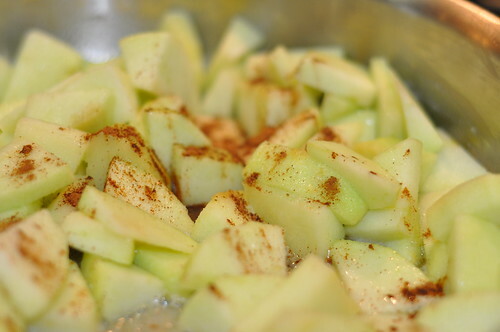 Add apples, cinnamon, and pinch of salt. 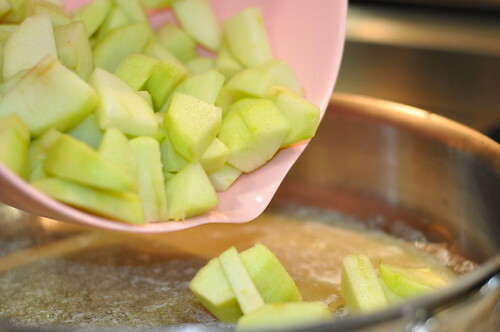 Cook, stirring occasionally, until apples begin to soften, about 7-8 minutes. 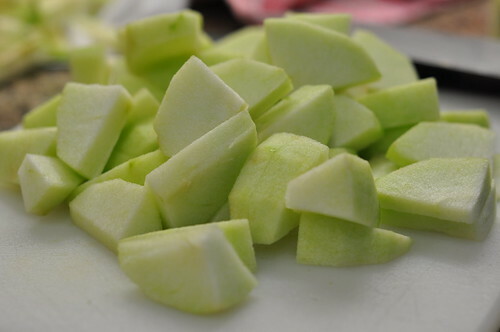 Gradually stir in sugar (if serving apples as a side dish instead of a dessert — highly recommend with ham or pork, btw — you may want to use a little less sugar). 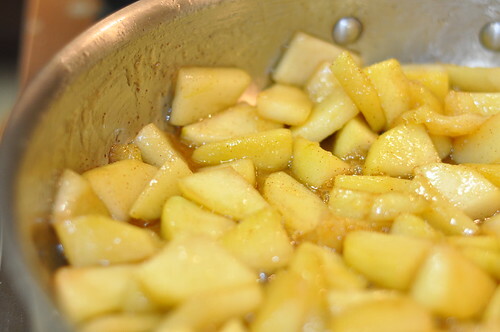 Cook until apples get slightly syrupy and taste delicious when you sneak a bite. Preheat oven to 300. 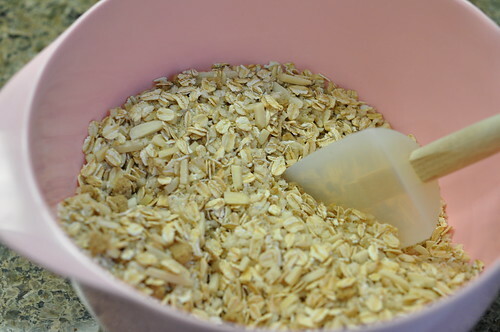 Combine oats, panko, almonds, and brown sugar in a large mixing bowl. 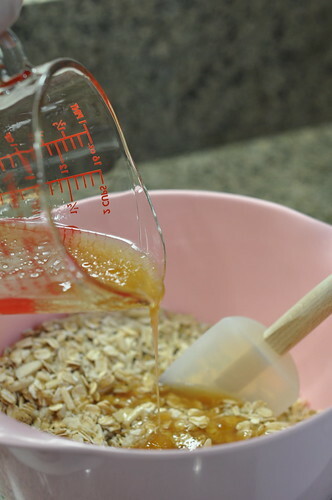 In a separate bowl or measuring cup, whisk together maple syrup, canola oil, and salt. 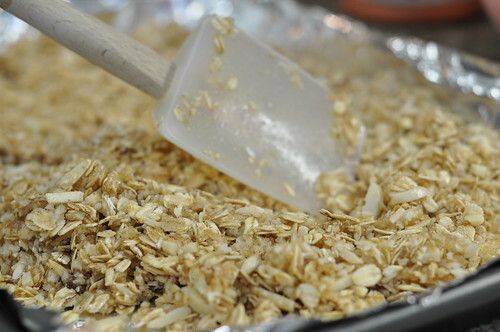 Stir the maple mixture into the oat mixture until thoroughly combined. Spread onto a rimmed baking sheet lined with foil and lightly sprayed with cooking spray. 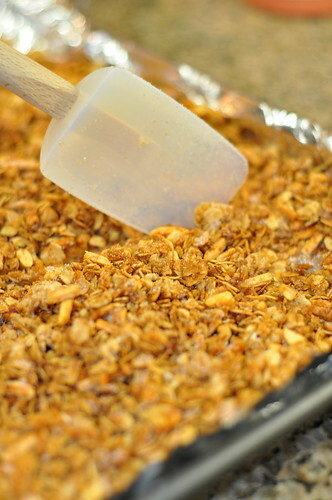 Bake for 1 hour or until granola turns golden brown, stirring every 15 minutes. Taste post-baking. 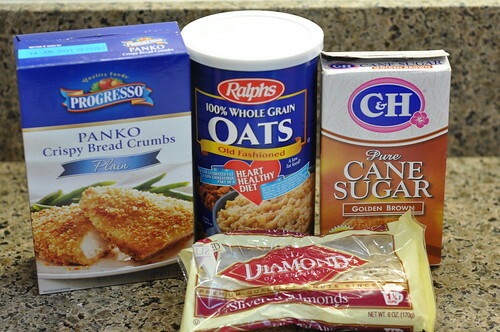 You may want to add the additional 2 T sugar and cinnamon. Up to you. I adapted this from one of Alton’s recipes, if you want to check out the original. I adjusted according to what I had in the pantry. Also, my oven doesn’t go as low as his does, so I had to adjust that too. 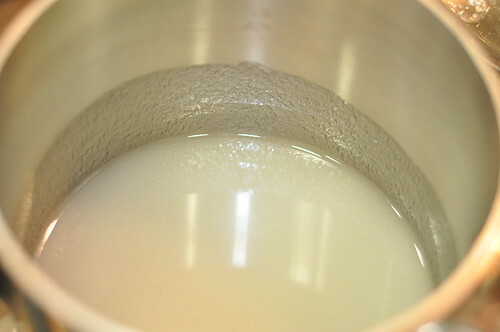 Pour sugar into a small, heavy saucepan and pour water evenly over it. 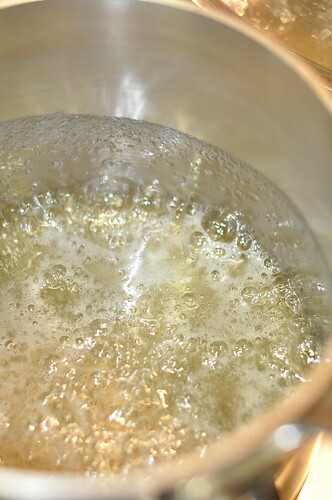 Set on medium-high heat, swirling the saucepan by the handle until the sugar is dissolved. 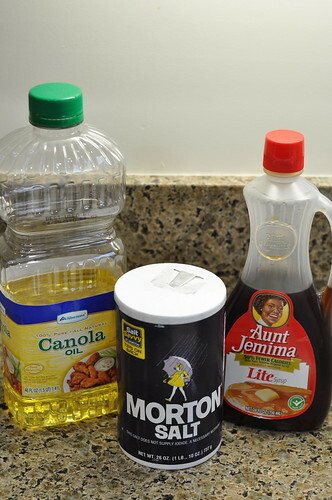 Avoid letting the syrup boil until the sugar is dissolved. Turn heat to high, cover the saucepan with a lid, and boil for 2 minutes. 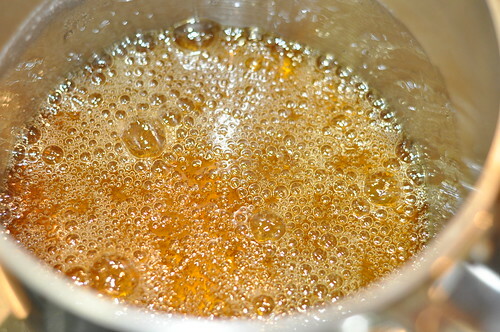 Uncover the saucepan and continue to boil until the syrup darkens. 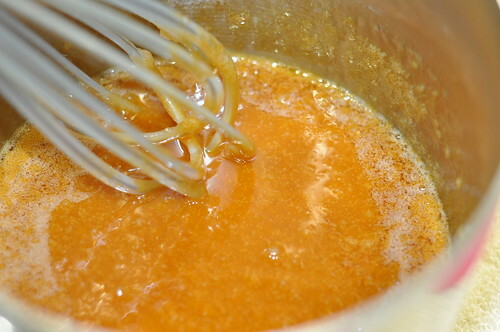 Keep swirling the saucepan by the handle until the syrup turns a deep amber color and just begins to smoke. 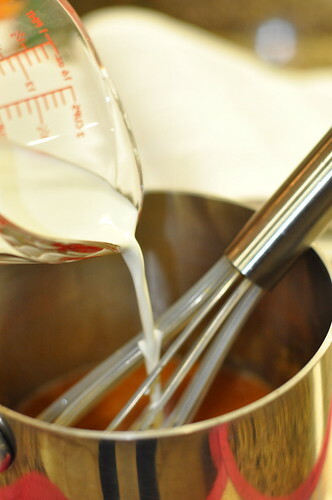 Remove from heat and, using tongs, gently lower butter pieces into the syrup. The syrup will boil up so be careful. 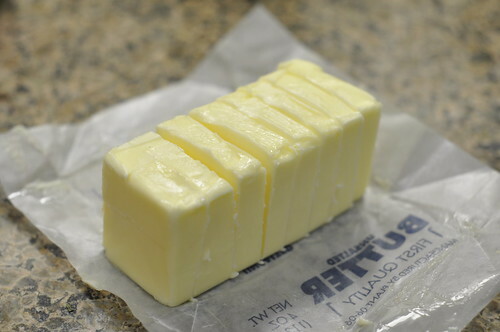 Gently beat until the butter is incorporated. 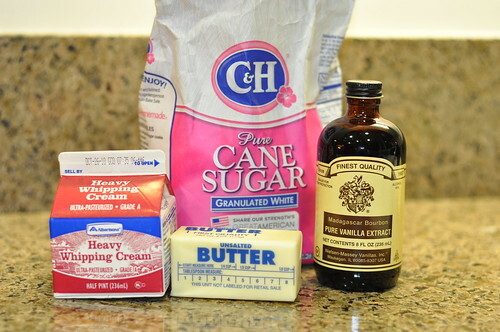 Stir in cream (again, it will boil up so be careful), then stir in vanilla and a pinch of salt. Be careful — it will be extremely hot throughout the entire process. The sauce will thicken as it cools. Serve warm or at room temperature. P.S. 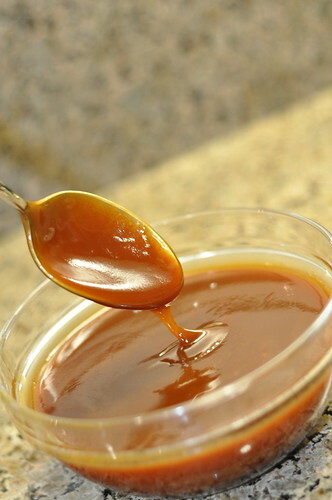 You could use store-bought caramel sauce instead of homemade. And if you wanted to simplify even further, you could also use store-bought granola or shortbread cookies and only make the apples. 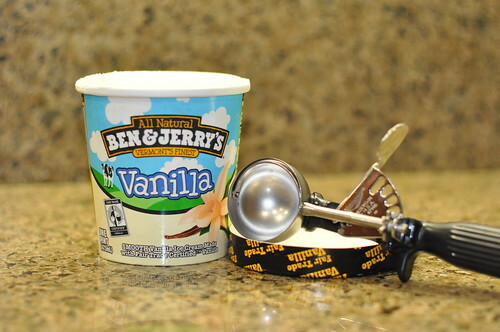 A perfect week-night dessert! P.P.S. Happy Birthday to brother-in-law Dan! Well I’m trying like heck to lose 50 lbs. so understand what you’re saying. I’ve only had dessert 3 times in 3 months so choose my splurge wisely. Looks like this is the ticket! YUM. This article gives clear idea designed for the new people of blogging, that actually how to do blogging. topic of media print, we all be aware of media is a enormous source of facts. port. The app’s layout is quite simple, and it works well that way. has to have all that’s possible and then some. abonnement lien ou newsletter service. Avez- vous avez Vous avez tout ? Se il vous plaît permis reconnaître sorte que abonner .